Pamela's Products makes gluten-free mixes and ingredients and finished goods as well, and they sent me a big box of stuff to try. I passed along the few items that had coconut in them (coconut just isn't my thing, but I have friends who are more than happy to take them off my hands), then moved quickly into tasting the cookies. Because, well, cookies. I'm not gluten-free, but I'm always interested in trying what's out there. While the cookies weren't the absolute best I've ever eaten, they were tasty. I liked the shortbreads, the best, but the others (chocolate mint, chocolate chunk, and chocolate chunk with walnuts) were good, too. For folks who can't have wheat flour, these would be a good option. Among the bags of ingredients, there was almond flour, which is something that I often use, and tiger nut flour, which I've never used before. That's the best of both worlds - the familiar and the new. I haven't open the tiger nut flour yet, but the almond flour made its way into cookies pretty quickly. Overall, it was a fun box of stuff to try, and I was able to share goodies with a friend who avoids gluten, so that's always a plus. Being totally honest, I don't think I'll be buying gluten free cookies for myself, but I appreciate that Pamela's Products makes them for folks who need them. Apparently their pancake mix is a best seller, if you're looking for that, and even if you don't avoid gluten, things like almond flour can come in handy if you bake a lot. Meanwhile, I need to figure out what I'm going to do with that tiger nut flour. I'm sure it will be amusing. Why yes, I did get this stuff for free. Pereg Gourmet sells a whole bunch of spices, and this time they sent me a free sample of their zahtar (sometimes spelled zatar or za'atar) which is a Middle Eastern spice blend. It can be used as an at-the-table seasoning, or for cooking. Like many blends, the ingredients can vary, depending on who is making it, so if you've tried one zahtar, it's worth it to look around and see what others have to offer. This version include hyssop parsley, sesame seeds, chickpea flour, coriander, olive oil, salt, and citric acid. The flavor is unique, and a little hard to describe, but somehow it reminds of of pizza. Interestingly, one of the suggested uses is to sprinkle it on pizza, but I think I'd be more likely to use it on hummus or pita bread. The jar from Pereg Gourmet was larger than I expected (5.3 ounces), which isn't a bad thing, particularly for a spice that you will use on the table and in the kitchen. Pereg Gourmet makes a lot of different spice mixes along with selling single spices, so if zahtar isn't on your must-have list, it's a sure bet you'll find something you have to have. I got this spice for free, and I've gotten spices from them previously, as well. I can still remember the first time I saw T-fal cookware. I was just a little kid, and someone was doing a demo in a store. I never saw a live cooking demo before, and I was enthralled. Someone was actually cooking right there in the store! Mom didn't buy the magical cookware that made eggs slide around in the pan, much to my disappointment. T-fal cookware isn't the same as it was back then. There are new materials, and, as you can see from this pan, new shapes. The pan I tested was infused with sapphire on the nonstick surface and it had pretty blue glints in it when it was in the light. It was from the T-fal Heatmaster Collection , and there are several different pans with similar features. But I guess the pretty blue speckles aren't all that important. What is important is that it's nonstick and not terribly expensive. 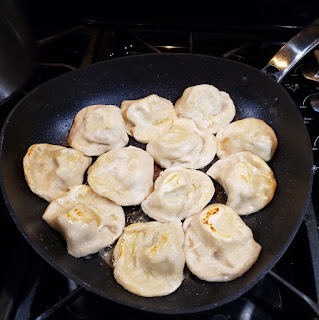 I tested the 10-inch triangle shaped pan, and I managed to fit 12 large pierogi in the pan all at once. I've also used it for sauces, steak, and other basic cooking needs. Do you need a triangle-shaped pan? I don't know. One good thing about it is that the shape makes it easier to pour things out of the pan. However, you won't have a lid sitting around that will fit it. But the few times I've wanted to cover what I was cooking, I used a round silicone cover and it did what I needed it to do. By the way, if you don't already have a round silicone cover, you should go buy one . Or a few. 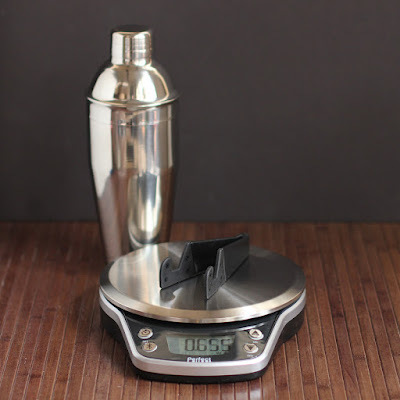 It's nice to have them in several sizes, to fit your largest pots and pans, to fit the small ones, and maybe some small ones to put on top of your drink to keep the flying things from diving in. They're great for us in the microwave, too, to keep stuff from splattering. Overall, the pan I tested did everything I needed it to. The surface seems pretty durable - it's even metal-utensil safe. It's oven-safe to 500 degrees, which is great if you want to start cooking something on the stove and finish it in the oven. The stainless steel on the bottom helps distribute heat and it also means it can be used on induction cooktops. So you get a lot for your dollars. If you're looking for a nonstick pan, consider the T-fal line. As far as the triangle shape, that's going to be a personal preference. I can see reasons why it might be useful, but on the other hand, it's not going to nest as well as round pans, if you're short on storage space. Like many other products reviewed here, I received this at no cost to me. When I got the pitch about this product, they talked about how Chicago folks don't use ketchup on hot dogs, but you could use this stuff instead. I thought that was kind of funny, but perhaps it's true. Perhaps. I got to sample three versions of MustKetch, the original, the zesty, and the smoky. It's hard to describe this stuff. At one moment, it's like a mustardy ketchup. The it's like a tomato-y mustard. It's different. And kind of orangy-red. You're saying to yourself that you can just grab ketchup and then mustard and add them separately. Well, sure, you could do that. But this is somehow more than just a blend of two condiments. It has become it's own condiment, if that makes any sense. So far, I've just used this on burgers and sausages, but I think it would be pretty awesome on a meatloaf sandwich. I'm also thinking about using it as a glaze on meat. The smoky, in particular, is on my list for slathering on pork. Maybe even ribs. Or for adding to a stew, perhaps. Yup, is might actually be a must catch. Hehe. I'm funny. But looks aren't everything. By the way, I did get this at no cost to me. Freebie in mah belly. I had a multi-cooker years ago, and I loved that darned thing. It was the replacement for a slow cooker, but it could also saute prior to cooking, which was totally awesome. Eventually, it got shoved to a corner of the counter and finally it moved itself into storage when the pressure cooker invasion began. Sort of like the British invasion, but without shaggy hair and guitars. I started loving the idea of quick cooking, and they could slow cook when I was in that mood. Then, I started missing it, because some things just don't fit well into a pressure cooker. 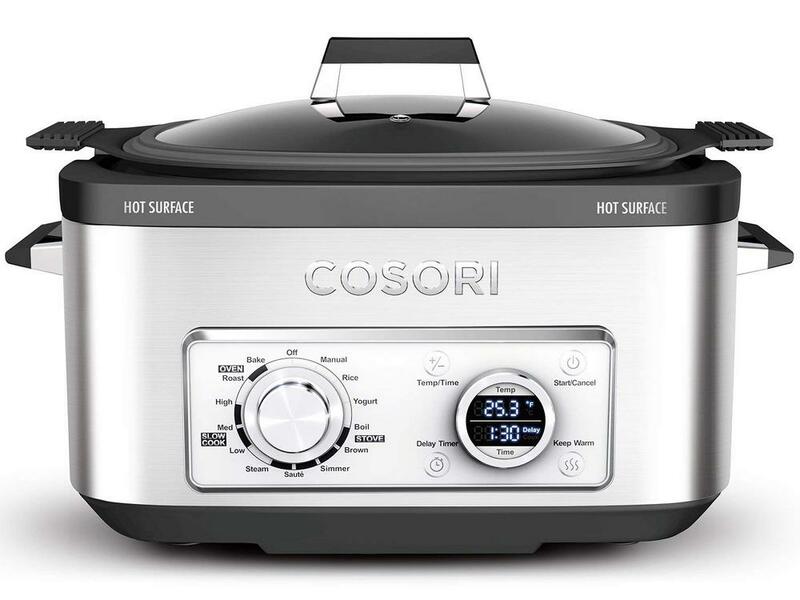 So, when the nice folks at Cosori offered me a unit to test, I said yes. I wasn't familiar with the brand, but after checking reviews online, I saw that users liked their products, and the features looked pretty good. The multi-cooker looked like it was solidly built, and when it showed up it looked like a quality product. One thing that puzzled me was that the gasket that fits around the lid was not installed, but then it made sense. Users should remove the gasket to clean the lid completely, and having it packed separately makes it obvious that it can be removed and replaced easily. Kind of a smart thing to do. 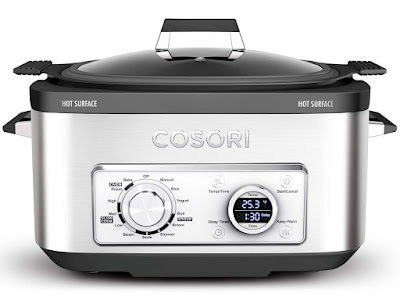 This critter has a much slicker, shinier, more modern look than the one I had before, One knob selects the type of cooking and the other knob selects time and temperature. 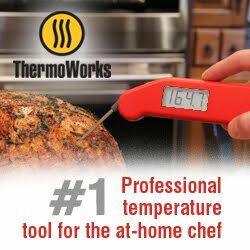 There are buttons to start or cancel the cooking process, to select time or temperature to be adjusted, to set the delay timer to start later, and to keep the food warm. One nice feature is that the handles on the cooking pot have silicone covers, so they're not as hot as screaming hot metal. I'd suggest using pot holders, anyway, when you're removing a hot cooking pot, just to be safe. First I tested the simmer function using plain water, and it was a nice, perky simmer. I steamed, roasted, and slow cooked, too. I haven't yet baked anything, nor have I made rice or yogurt, but I'm sure those functions are fine, too. Overall, this is a really nice cooker. The shape is nice, so you can get a roast or a chicken in there, and the cooking pot is nonstick, so it's easy to clean. This came with a chrome-plated rack that fits the pot. The rack has reasonably tall handles, so you can get it out of the cooker easier, even if you've got liquid in the bottom of the pot. I used the rack for steaming and roasting. Why yes, I did get to test this for free! When they holidays come, it's a sure bet that liquor stores will have displays of a variety of products that are fit for celebrating or for gifting. Some of the most interesting are the limited-edition boxed products, some of which include extras, like fancy glasses. When the nice folks at DiSaronno emailed me about their limited edition bottles, covered with a design by a fashion designer, I thought, well, sure, I'll take a free sample. I've loved DiSaronno for a long time. It's great over ice, and there are plenty of cocktails where it fits the glass, too. It's sweet and a little nutty, and it has a nice warmth without being harsh. While I normally think if it as a winter drink, I've also seen it used in an "Italian Margarita" which included lime juice for a refreshing, summery cocktail. Luckily, the bottles I got were full and not just samples of the design. Lucky, lucky me, right? Not only did I get a single boxed bottle, but also a set that included some pretty glasses, and some three packs of little bottles that would make awesome stocking stuffers. Look for 'em next time you're shopping for beverages - they'd all be darned easy to wrap. Trussardi is an Italian fashion house, so it's a good pair for the liquor, and the colors are interesting with bright yellow, bright and light pink, pale blue, and orange, among other colors. My inner hippie approves. These are not your usual Christmas colors, so it will look good behind the bar long after the tree is kindling and the presents are no longer new and shiny. Why yes, I did get these at no cost to me.